The Space Tracking and Surveillance System Demonstration satellites are far more capable today than when launched four years ago thanks to enhancements that fully leverage their unique sensor suitethey arent just for missile defense any longer. June brings us the annual Joint User Interoperability Communications Exercise (JUICE) to demonstrate interoperability of new and emerging technologies by emulating the tactical edge of the battle space. Case In Point: Afghanistans NexGen Communication Moves, Few nations in the 21st Century face the challenges that confront the nations first democratically elected government today. Throughout the ages, Afghanistan has been at the crossroads of many empires. The areas people and territory have faced conquest by the Greeks, Arabs, Mongols, Turks, British, Soviets and, following the September 11 attack on New Yorks World Trade Center, the United States. 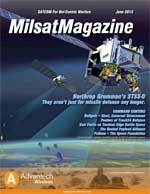 MilsatMagazine recently had the opportunity to discuss the recent acquisition of TC Communications by Inmarsat, especially as to how such will impact the Companys business in the APAC region of the world, as well as to learn more concerning these gentlemen and their careers. Even though Im generally known to be a pretty optimistic guy, I dont mind telling you that my nerves were a bit frayed as the countdown clocked neared T-minus-zero for the 29th National Space Symposium. As youll know by now if you attended the event, and as you can read in our post-Symposium report throughout this edition of Space Watch, this years Space Symposium was one of our best ever, and a triumph over adversity. Giles Peeters commenced his military communications career in the U.K.s Royal Air Force (RAF) in 1989. He worked in the MoDs Defence Communications Security Agency (DCSA) as operations officer and procurement manager in the Satellite Service Delivery team before moving to the U.K. Government Communications Headquarters (GCHQ) Cheltenham in 2001. From 2004 to 2007 Peeters significant expertise in commercial satellite communications proved invaluable in Iraq and Afghanistan as he provided front line tactical communication and deployment capability for Joint Helicopter Command. Peeters final rank was RAF Squadron Leader.